Of all the screen stars from the golden age of Hollywood, Joan Crawford may be the most controversial. Ever since the tell-all Mommie Dearest by her daughter Christina (and the ensuing over-the-top camp movie), Crawford’s image has gone from glamorous movie queen to unhinged child abuser ready to go off at any moment about Clorox cleanser and wire hangers. More recent efforts like Ryan Murphy’s sublime mini-series Feud offered a more balanced portrait of the star, but Mommie Dearest remains a difficult hurdle for Joan Crawford’s legend to clear. For some reason, I still find Crawford rather fascinating. She won her only Oscar as the long-suffering mother Mildred Pierce and then went down in the annals as reportedly one of the worst Hollywood mothers of all time. She still gets me in soapy melodramas like Possessed and Humoresque. But I was even more intrigued when I fond out that she released a book in 1971, six years before her death, called My Way Of Life (now again available in paperback, thanks to Feud I guess). As Amazon describes, “Part memoir, part self-help book, part guide to being fabulous, My Way Of Life advises the reader on everything from throwing a small dinner party for eighteen to getting the most out of a marriage.” (Granted, she had many failed marriages.) It’s Crawford’s assertion that all we need is a little organization that I find so intriguing. She says, “I organize myself right down to the second because I’m greedy. Greedy to fill every minute of my days with all the things I want to accomplish.” As someone who despairs over my own disorganization, I want to sleep with My Way Of Life under my pillow and absorb Crawford’s teachings through osmosis. So for this column I felt compelled to feature a Crawford party recipe. 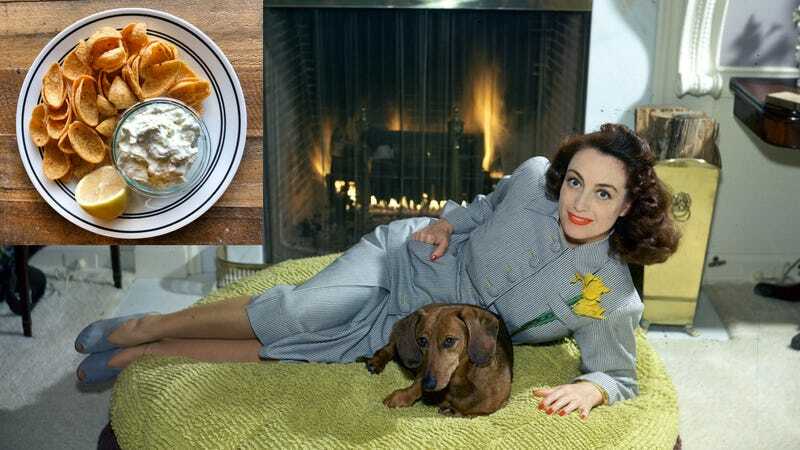 This one—once featured in a Frito-Lay cookbook, according to the Hungover Gourmet—cracks me up because as fancy and glamorous as she was, she still understood the value of a cream-based, powdered-seasoning party dip. Preferably with giant-size Fritos. Unfortunately, when I went to the grocer, Joan’s suggested twin pack of Fritos Horseradish Dip Mix and Fritos Green Onion Dip Mix appears to be a thing of the past. I panicked for a second, then thought, “What would Joan do?” She’d make her own, dammit, so I picked up a packet of ranch seasoning with some green onions and horseradish. Fortunately, giant Fritos are still available. They’re now called Scoops! Actually, I like my changes. The chopped green onions added some nice texture, and the horseradish kicked in a little heat (you may want to add in 1/2 teaspoon increments; you’ll know when you’ve gone too far). All in all, it turned out pretty party-worthy (and a bit addictive): I think even Joan Crawford herself would have approved. Soften cream cheese with milk; add sour cream and mix well. Add remaining ingredients and let stand 30 minutes. Serve with Frito’s King-Size corn chips or Lay’s potato chips.